Tri-Star was a familiar fairground ride of the time, and some are still seen in travelling fairs around the country. 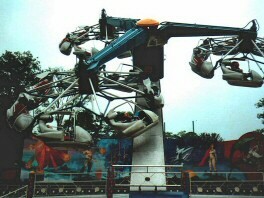 A simple spin 'n' spew ride that proved popular for many years. It was located in the area behind Talbot Street that also once hosted the Four Man Bob, Alton Mouse and Alton Beast.